Recommended to: Readers looking for an amazing adventure with a strong and capable female protagonist. 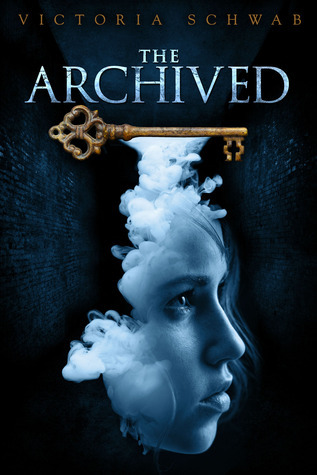 I missed out on Victoria Schwab's first book, so I knew for a fact that I'd be reading The Archived. After all, I was instantly intrigued by the premise. A place where humans are stored like hard drive copies of themselves? Creepy, yet interesting. I only hoped it would be done as well as the synopsis seemed to promise. Lucky for me this turned out to be everything that I was hoping for! Not only was the concept original, but the execution of it all made this a book I couldn't get enough of. First off, I have to say that I loved Mackenzie. She's strong, stubborn, and yet amazingly easy to fall into step with. Her character was very layered. On the surface is a girl who has been hurt, and shuns deep interaction to keep others safe. However the more I read, the more I saw beneath her gruff exterior. I saw a girl who just wanted someone to talk to. A girl who missed her brother, and really needed a friend. Enter Wesley Ayers, the exact inverse of his female counterpart. I thought they were a perfect match! For every gruff part of Mackenzie that came through, there was an equally friendly and goofy part of Wesley. He is the epitome of a nice guy. The banter between Wesley and Mackenzie is priceless, and their interactions are really what keep the book moving along. I adored him. In case you're not already sold, I absolutely have to gush about the setting that Schwab picks for The Archived. Set in a crumbling old hotel-turned-apartment called The Coronado, Mackenzie's story has an added bit of creepiness. Old places hold onto history. They have dark, hidden secrets. This building is no exception! No spoilers from me, but trust me when I say this is a perfect companion to the Narrows that the characters wander in and out of. I was genuinely on edge at times as clues to the building's past were slowly laid out, and it made me read that much more ravenously. I think it's clear to see that I utterly enjoyed this book. I could ramble on about the excellent writing, or the fact that Mackenzie actually has a real family in her story, but the point remains that this is a book well worth your time. The Archived has earned a spot on my shelf of favorites and I am eagerly awaiting the next installment! There are so many questions I have, and I can't wait to see where Victoria Schwab takes me next.